How to request archive documents and materials ? Mon, Tue, Thu: 9:00 – 16:00h. Mon - Thu: 8:00 – 14:30h. 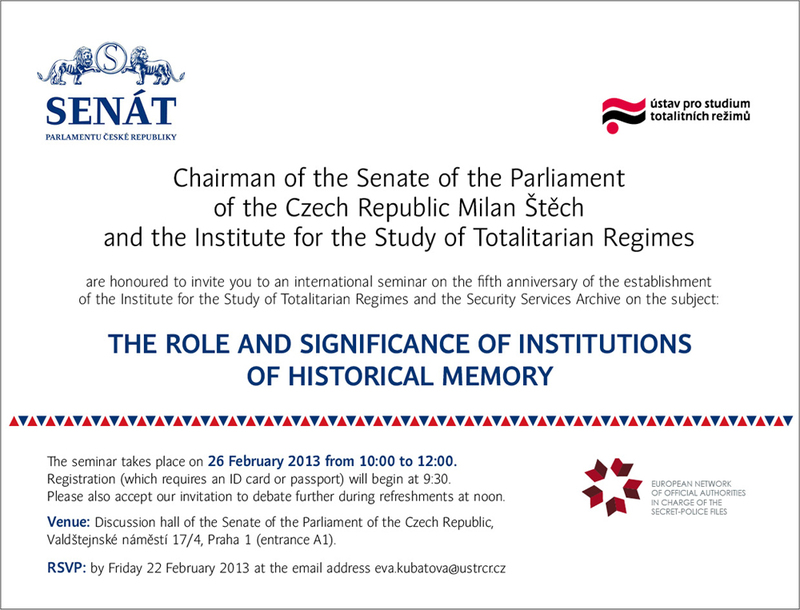 Please accept our invitation to an international seminar on the subject The Role and Significance of Institutions of Historical Memory, which will take place on 26 February 2013 from 10:00 in the Discussion hall of the Senate of the Parliament of the Czech Republic under the patronate of the Chairman of the Senate, Mr. Milan Štěch. makes decisions regarding archival administrative procedures and record services. © Czech Republic - Security Services Archive 2008 - 2013. All rights reserved.